Aventúrese en el interior de un antiguo sistema de cuevas en el parque Nohoc Chen en una aventura en kayak en la cueva desde la ciudad de Belice. Leyendas antiguas y una cascada subterránea te esperan dentro de una serie de cavernas que explorarás con un kayak simple o doble, usando un faro LED para iluminar formaciones rocosas cristalinas. También harás una caminata por el bosque lluvioso de Belice y remarás por los tramos abiertos del río Caves Branch en este tour de medio día en el corazón de las montañas mayas. 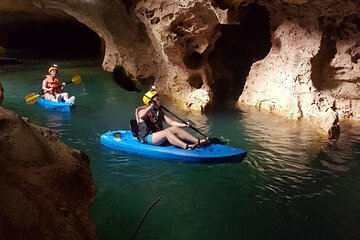 Excursión en kayak por la cueva de Haf-day desde la ciudad de Belice. The staff took really good care of us. Elvis was full of fun facts about Belize and his other travels. We traveled with very small children and Elvis went out of his way to ensure that we were safe and had a great time. We had an experience that far surpassed my expectations on our Cave Kayaking excursion. Sharon was fantastic! On the hike to the kayaks she pointed out many interesting plants and animals, including leaf cutter ants that were line up with their leaves all the way to the top of a tree. Kayaking the caves was also fantastic! Sharon was an excellent guide and helped us to navigate the caves as well as areas with shallow water. She even lead us to a spot where we were able to get out of the kayaks and jump off some boulders into the cool and refreshing river water. If you want to do something different than what everyone is doing when they get there, do the kayaking.  This company is the only one that was out there when we went. Jeremy was our guide. He took us to areas that "tubers" couldn't go. It was good because when we did mix in with the tubers, it was loud! Jeremy warned us ahead of time, but man, we didn't realize the ratio of tubers to kayakers. Basically, it was 5 of us versus all of them. Definitely try this route if/when you go. It's well worth it and having a good guide like Jeremy that knew the area definitely helps. He even took us to lunch in an area where there weren't much crowd so we can eat peacefully. Ask for Jeremy when you go, you won't be disappointed. We did this as an excursion from the Rhapsody Of the Seas. The van was waiting dockside for us. It was a bit small for the 45 minute ride, but ok and air conditionded. Our tour guide was Rock, he was very knowledgeable about the caves and the Belize jungle. It took us about an hour walk to get to the site where we started tubing. The good thing is where you finish is about a 5 minute walk back to the camp. Loved this excursion and the guides. We were a group of 12 with two guides. They kept our things locked in the van so we did not have to pay for a locker. We were able to to go to 5 or 6 caves. After our adventure, one of the guides grabbed us some local cuisine that was delicious. The only thing I would say is don't wear typical water shoes. The trail you hike is rocky and water shoes aren't supportive enough. Wear something with a thick sole. You can rent crocs when you get there if you so choose. My husband and I LOVED this!!! It was awesome. The kayaking itself is slightly strenuous, since the river is very lazy. You have to paddle both upstream and downstream. Very enjoyable experience. This was an awesome excursion. Our guide Abner was very friendly and knowledgeable. He was funny too. Everyone enjoyed themselves. The water was just pristine and beautiful. I would definitely do this excursion over again. Take this one over the tubing one. You see and do more with the kayaking. They hook you together on the tubing excursion. 5/23/18 - If you are considering a tour through the caves - TAKE THIS TRIP!! This is SOOOO much better than tubing!!! First, we met in Belize City right outside the port gates where we boarded a bus that took us to base camp. The guides were great! The trip there was VERY informative - he knew so much about his City and it was very apparent they all loved Belize! He told us so much about their economy, agriculture, way of life, etc. We learned alot and really appreciated his passion for his country! On the way, we were fitted with our helmets. When we got there we were given our life jackets. YOU CAN NOT WEAR FLIP FLOPS - wear water shoes. We hiked through the rain forest which was simply amazing! NOTE - we didnt have to carry big tubes through the rain forest like other people! Our kayaks were waiting for us at the launch place! Our guides pointed out many plants and animals! Like a tarantula and termites! and taught us about the rain forest! The hike is about 30-40 min. It is pretty flat, but uneven. We had a couple that was about 70-ish yrs old - they did pretty well!!! The bus trip was pretty bouncy, so if you have a bad back, take that into consideration When we got to the launch place, our guides let us swim in the cool clear fresh water at the mouth of the caves - it is absolutely amazing!! Our guides suited us up, gave us some Kayaking 101 lessons and off we went. It was very simple - some in our group had only kayaked once and some had never kayaked - we all did great!! Our guides were patient and very kind and helpful!! They really seemed to love their job! They were enthusiastic and encouraging!! We went through the caves without any problems - I suppose the biggest problem was avoiding the tubers who were all tied together - we could just float right past them!! The sights in the caves were spectacular!! We didnt go fast, just cruised through. We had a couple to flip over, no problem, just get back in and cruise on - no big deal. Our guides were right there with us!! Our guides told us about the formations in the caves, but it was a little hard to hear at some points because there were alot of tubers. It was still amazing to see and experience!!! I cant think of ANYthing to caution you about! It was amazing!! Everyone in our group had a great time - young and old! We got back to base camp where you could grab something to eat not included in price and a souvenir. Then we made our way back to the port. These guys were amazing. I actually fell in love with Belize. I know there are security warnings about Belize, but we were never worried or was afraid! Our guides were trustworthy and wanted us to enjoy ourselves. Belize is a very special place to me and so are the people there! I would definitely go back!! This tour totally exceeded my expectations! I was traveling with 7 family members ages 25-55 on a Carnival cruise and wanted to do something outside the normal cruise expeditions. I was nervous to book a third party tour, but VIV Tours totally took care of us. After tendering to shore it was easy to find our tour company at 9 a.m. as advised, but the only downside was that we waited around for an hour because another group had also booked the same tour but never showed up. Standing in the hot sun with no information about when we might be leaving was frustrating, but it ended up just being the 8 of us for the tour, so I can't complain too much! I can't say enough good things about our guide Abner. During the hour-long ride to the caves, he gave us candid and thoughtful explanations of sights we were passing and Belizean culture. When we arrived at the site we changed and bought a quick snack and geared up we could leave our backpacks in the van which was nice and took a leisurely 30 minute walk through the forest to the caves. Along the way Abner went out of his way to point out different fruits, trees, animals...he even talked us into eating termites! We crossed three rivers on foot, but the rest of the trail was wide and flat. The mouth of the caves were filled with hoards of tubers--we hopped into our double kayaks and glided past them into the first of several caves. The tubing groups could only go a couple caves in, and soon enough we were cruising along by ourselves through cave after cave that most people don't get to see. It was truly magical--we entered one that was FILLED with bats cool, not scary! and turned off our headlamps and sat in the darkness and silence for a bit. We stopped off on a small beach area to stretch our legs and jump off a rock under Abner's guidance. The second half was kayaking down the river, but the water was very low which caused us to get stuck and/or have to get out and walk a lot which was a bummer. Nevertheless Abner kept us in good spirits and got us back to the starting point, where we cleaned up, grabbed a cold beer, and Abner got us a delicious local lunch of beans, rice, chicken, and soda for 10 each that we ate on the drive back. We were hiking and kayaking for so long that I was worried about getting back to the ship on time 4:30, but Abner got us back with plenty to spare, and it was amazing how much we were able to fit in during our stop! The hiking kayaking can be tiring mostly because of its length, so if you're comfortably mobile I would 100 recommend this over the tubing--you see so much more, and the people in the tubes looked pretty bored honestly. My parents had never kayaked before and went slow but still had a great time as well. Be sure to bring water and snacks, and wear sandals that strap to your feet, toe shoes, or Crocs really!. You can also rent Crocs for 3. The drive to and from the caves is fast and bumpy so keep that in mind if you get carsick. Overall I'd highly recommend this excursion--we were well taken care of, it felt very exclusive and unique, and it was honestly better than a private tour I booked in another port! Abner is a fantastic ambassador of Belize. This was just a once in a lifetime tour. The caves were beautiful and so much better that the tours of hundreds that were going in tubes. 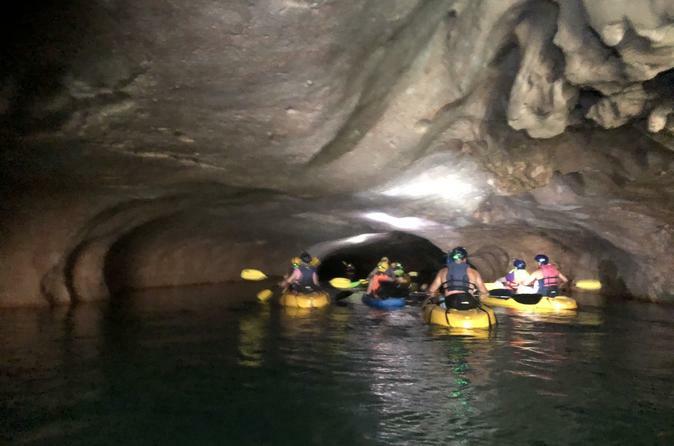 Kayaking allowed us to see so much more the tubing and like I said there were hundreds that were floating on the tubes and only a few kayaks so needless to say we went places in the caves that no one else was in.